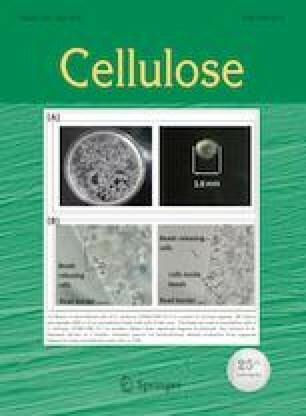 This report describes the synthesis of highly carboxylated cellulose nanocrystals (CNCs) from jute fiber by facile oxidation with ammonium persulfate (APS). The oxidation time effects on microstructure, surface chemistry, crystal structure, and thermal properties were investigated. Crystal-like morphology was obtained with 5.2 nm average particle diameter and 300–500 nm length, depending on the oxidation time. The degree of oxidation (DO) was found to be 0.27: the highest among APS-oxidized CNCs. The carboxylic group amount of 1550 mmol kg−1 was achieved for 16 h oxidation treatment, resulting in high surface charge with the absolute zeta potential value of 40 mV. The DO value was well correlated with the peak intensity of carbonyl group ascertained from FT-IR studies: 0.12 + 0.38(I1730/I1060). As-prepared CNCs showed improved dispersibility in organic solvents up to 15 h. The APS oxidized CNCs showed good thermal stability: the onset decomposition temperature was 240 °C. Using X-ray diffraction method the crystalline index was ascertained as more than 67%. Surface modification of APS-oxidized cellulose nanofibers (CNFs) was confirmed using FT-IR and XPS. Modified CNFs were dispersed in organic solvents such as toluene and THF. Jute is a good candidate material for obtaining highly pure and crystalline CNCs through APS oxidation, exhibiting great potential as a functional material for use in diverse fields. The online version of this article ( https://doi.org/10.1007/s10570-019-02363-7) contains supplementary material, which is available to authorized users. This work was supported by a Grant-in-Aid for Scientific Research (B) (16H04197) from the Japan Society for the Promotion of Science (JSPS). The work was also supported by the Research Program of “Dynamic Alliance for Open Innovation Bridging Human, Environment and Materials” in “Network Joint Research Center for Materials and Devices”. The Central Analytical Facility of IMRAM is also gratefully acknowledged for providing AFM, XPS and SEM instruments. HZ thanks the Kurita Water and Environment Foundation (KWEF) for financial support.